There was an oval lodge in which lived a man and his wife. The man was an accomplished hunter: whenever he would go out, he would pack something back. His meat racks were always full, yet he still hunted and killed many a deer. However, his wife noticed that whenever he brought back a deer, he would leave the liver behind. One day she asked him, "Why don't you save the liver? I could use it to tan the hides." Just the same, the next night he brought back a deer again without its liver. She asked him, "Why do you act thus? Have I not told you that I have need of the liver for tanning?" Nevertheless, on the third night he once more brought home a deer without its liver. This time the woman became very angry and let the meat sit there unattended. So her husband relented and said, "All right, tomorrow I will bring the liver back with the deer." On the next day when he finally came home, true to his word, he had packed the liver. She was overjoyed, and proceeded to chop up the liver, boil it, and eat it. She did this even though she said she wanted it for tanning. The next day the man went out hunting, but much to his surprise he was not able to get anything at all. So too the next day and the day after that. They had exhausted their supply of fresh meat and now had to begin using their stores. The fourth day the man went out, but again he was not able to get anything. Indeed, thereafter, he was never successful, and soon they had consumed all that was on their meat racks. They were reduced to boiling bones and drinking it as soup. When that ran out, they scorched their supplies of deer hides and ate them, but eventually they too ran out. Soon they were starving. He had become so weak that he had to use a cane to walk. Finally, he fell into despair and resolved to go off into the wilderness and die. As he went along, he saw a hill ahead of him. Then, unexpectedly, there at the base of the hill a deer bolted out of the woods. It was being chased, but every time its pursuer jumped on it, the deer was able to shake free. So the man went over to the hill in the hope that he could get the deer himself. Again the pursuer nearly got the deer, but it escaped his clutches. It was a white wolf that was doing this. The man followed the trail in time to see the wolf again try to jump the deer but fail. Finally, the deer fled into the ocean, but there the wolf caught it. The wolf held onto the deer until the man waded out and killed it. It was all they could do to drag it to the shore. The wolf sat down. He was very poor and his coat had entirely disappeared so that there was nothing but bare skin showing. The wolf said to the man, "My younger brother, you did not heed what I told you. You have caused me to suffer very much, although you suffered also; but at least you ate well for awhile, but ever since you gave the liver to the woman, I have not eaten a thing. You have done wrong, but we have lived through it; but if we had not seen one another, we should both have died." Then the man cut open the deer and cleared a spot in the snow. There he placed the liver. The wolf ate it all. The wolf was the man's older brother. When the wolf's younger brother had become ready to live among the humans, he had told him, "Younger brother, as long as you remain among the humans, every time you kill a deer, I will eat the liver. Do not ever do anything else with it." Even though his brother had forbidden him, the man had done it anyway. In the past he had always cleared a spot in the snow or on the ground and left the liver from his kill, but because of what his wife had wanted, he now could no longer kill any game at all. However, that night the brothers ate very much indeed. The wolf said, "Younger brother, let us remain here over night." So they built a pyramid of snow and slept on top of it. That night it was extremely cold and the wind blew from the north with an icy sting; yet there they were perspiring. The next morning when they awoke, there, unexpectedly, they found themselves on a floating ice sheet that was breaking up. Their block of ice floated farther and farther out to sea, until soon they could not see the land that they had left. White Wolf said, "Younger brother, we have gotten ourselves into another fix. Thus it would be, so I forbade you. Now we are really in trouble." In time they drifted across the entire ocean and landed on the opposite shore. There they saw a big coastal village. It was the village of the Wáñgerúčge, the cannibal Giants. The wolf said, "It will be very difficult, younger brother. The things that I am about to say, this time I want you to do them. That way only will it be. You must kill me and skin me and with the middle length, you must make bracelets for yourself. You must never let go of them, for if you do, you will create misery for yourself. Half of this village doesn't eat humans. That half is the Good Giants. Their chief lives in the long lodge and has a daughter whom you will marry. You must do your mightiest and be sure to do what I say this time. Now, then, kill me." So he killed his brother, cut out the center length of his hide, and made two bracelets. Then the man set out for the chief's lodge, and when he entered, those inside said, "Hąho!" He went directly to the yųgiwi (princess) and sat down next to her. They were thankful and said, "Oh daughter, it is good. You have dreamt." That night he was married to the princess. An old man would often linger around the chief's lodge. One day he came into the lodge with a gourd rattling from his waist, and declared, "Oh, you chief! I come to challenge your son-in-law to a game." The chief sat with his head bowed and said nothing. He knew that they would eat him if they were victorious. The man said to his wife, "Tell them I accept the challenge." She said to the chief, "Father, he says you may answer for him." Then the chief exclaimed, "All right!" When the challenger returned with the news, the Bad Giants were overjoyed and greatly looked forward to eating the man. Soon the whole village knew of the challenge. At the end of the village lived an old woman and her grandson. The boy said, "Grandmother, I would like to go away with my friend to gamble, so go tell him." His grandmother scolded him: "You homely orphan with burnt breast, you are far from being able to do such a thing — but I will tell him anyhow." She went to the chief's lodge and told them what her grandson had said. Unexpectedly the son-in-law said, "Ah, grandmother, it is good! I have no partner." She quickly returned home and told her grandson of it, so he immediately got up and went over to the chief's lodge. The next day the two of them set out together. The Bad Giants were eagerly waiting for them. When they arrived, the Bad Giants said, "We will play Good Shooter." "All right," the two friends replied. The two who were going to shoot came forward and the contest began. The orphan proved to be a great shot, and the Bad Giants were defeated. The victors took the two Bad Giants and shot them dead with their arrows. The two friends returned to the chief's lodge, and the orphan lived there with the son-in-law. That evening the old man returned and declared, "Oh, you chief! I come to challenge your son-in-law to a game." The chief was now more confident and said, "All right!" The next day the two set off again for the contest, and this time many others went along to watch. The Bad Giants declared, "We will run a race." Two Giants came forward to the starting spot to race against the two friends. When the race began, the friends were about equal in their speed, but far exceeded the pace of the Giants. As a result, they won the race and proceeded to kill the two Bad Giants whose lives had been wagered on the outcome. That night the game challenger again appeared and declared, "Oh, you chief! I come to challenge your son-in-law to a game." The chief, who by now had no fear of the outcome at all, said, "All right!" That morning when the two friends went to the games, the Bad Giants said, "It will be in the night that we will complete. We will play, See who can Sit on the Ice Longest." When they returned that evening it suddenly became bitterly cold. The wind turned and now blew from the north with gale force. So hard was the biting wind that it churned up snow in its whirlwinds and everything looked yellow. The terms of the game were this: they were to sit naked on the ice and the first pair to fall over from the cold were the losers. So the friends and their two Giant competitors stripped completely naked. The son-in-law now did just as his older brother had done before him: he took the snow and piled it into a great pyramid, and sat atop his mountain of snow. As he sat there he became a wolf whose coat was as white as the snow so that he could hardly be seen. His friend, however, cleared away the snow and sat directly upon the ice. The Giants adopted the strategy of trampling down the snow and sitting on that. Then during the night, where the wolf sat, something went along under the ice. It made a noise as it went along and it finally came to where the orphan was sitting and there was heard a splashing sound. The orphan said, "My friend! I am sweating so hard that I want to splash water on myself to cool off." It was he who was going about in the water. When the wolf looked at him, he saw in his place a beaver. One of the Giants began to chatter his teeth and the cold began to get to him until finally he keeled over on the ice. All the spectators yelled, "You have defeated one!" Then the other Giant's teeth began to chatter loudly, and he too toppled over. "You have defeated them!" yelled the spectators. So they all went home. Although they had worried at first, they now knew that the two friends were wákąčąk (holy). The chief said, "I will heat some stones for the son-in-law and his friend, as they might be tired." So he put a stone in the fire and built a sweat lodge. It was still night time. Then he made a bath for them. The two friends stripped completely, and the son-in-law even removed his leather bracelets, which he put under a mat. In the hours of darkness the challenger once again made his appearance, and the chief with complete confidence accepted the challenge on behalf of the two young men. In the morning they went out to the fourth contest. The Giants announced, "Today we are going to wrestle." The young men said, "All right." It was very difficult. Soon the Giant threw down the son-in-law. The orphan held on for a long time against his Giant opponent, but finally the Giant threw him down too. The Giants then killed them both and that evening had their favorite soup. At night while the people slept, the leather bracelets suddenly came alive and went outside. They had become the white wolf from which they were made. He gathered all his brother's bones except one small bone, the knee cap. He looked very hard for it, high and low, for if he could not find it, he would fail. As he was searching, he heard the laughter of women coming from the other side of the hill. He followed the sound, and there on the other side of the hill was an oval lodge full of women. They were all virgins. He could see that one of them had a bone in her mouth — the very knee cap that he had been searching for. He thought very carefully about what he should do. He decided to turn himself into a poor, mangy, little dog so that they might take pity on him. In that form he entered the lodge. He looked at the woman with the bone eagerly. The other girls said to her, "Give him the bone that you have in your mouth as he is watching you eagerly and he is very pitiable. So give it to him." She replied, "This bone I intend to keep in my mouth until I wear it away because he killed many of my brothers. You shouldn't bother about him." She then picked up a poker and hit the dog so hard that she nearly killed it. As he staggered out of the lodge, he passed water. The girls were shocked and said, "Say, you've made the poor dog very pitiable!" But she replied nonchalantly, "You trouble yourselves over nothing." The dog stood in the door peeping in. The woman made the knee cap protrude in the side of her cheek. Suddenly, at the very moment, the dog lunged for her and bit out the side of her cheek, escaping with the bone. They all rushed outside, but what they saw there was a creature to be feared. He was completely white. The woman screamed, "Oh, my mouth!" but the others mocked her and exclaimed, "We told you to give it to him." Meanwhile the wolf had made it to the top of the hill where he gathered all the bones together, both those of his brother and those of the orphan, his friend. Then for as long as his breath held out, he gave a long, loud howl. He did this over and over, and on the third time the bodies had formed perfectly, but they did not stir. He needed to howl once more to make them live, so he howled with all his might, until he collapsed dead. 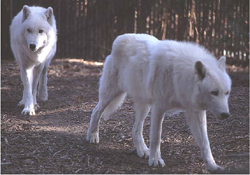 However, the two young men arose alive, and when they saw what had happened they brought the white wolf back to life. "Younger brother," said the wolf, "how often have you made me suffer because you would not do as I told you? I was nearly killed by women, maidens living over there." Then the man spoke, "Older brother, you have spoken the truth, but this time I did not mean to do it." The two friends both thanked him profusely. Back at the village everyone was in deep mourning. That morning the man and his friend walked into the village and walking behind them was something terrifying. The orphan went home, but the man and his lupine brother headed for the chief's lodge. Once inside, the man cleared a space for his brother to sit. When the other Giants saw the orphan walk in, they became afraid, seeing that he was risen from the dead. In terror they said to one another, "Let us never challenge them again — there's no way that we can kill them." In time the son-in-law had a child. One day his father-in-law said, "My daughter, it is about time that you went back with him where he came from. They must be lonesome for him about this time." The man replied for himself, "The one who was where I lived is surely dead. I have nowhere to go. I lived alone with a woman and this is my older brother. He forbade me to do something, but I did it anyway because the woman said so. From that time forth I killed nothing and we began to starve. So I went out to the wilderness to die, but there I found my older brother chasing a deer. I followed him and we killed it in the middle of the ocean. We slept there all night, and during the night the ice broke up and we washed ashore on this side of the ocean. That is how we came here and that was long ago, so she must be long dead by now." The old woman said, "Daughter, you had better go anyhow. The humans are clever and don't die easily. So you had better go see anyhow." So they started back. They were getting ready to return by boat. The white wolf said, "Younger brother, from now on let us live apart as we have often been in trouble. We have had nothing but bad luck, so you should look out for yourself. So you can leave me here alone, but whenever you end this life that you are now living, you may come home. I should not be there among the humans, as the Creator did not create me that way." His brother replied, "All right then, if that is your wish." They got in the boat and crossed the ocean. When they got to the other side they left the boat and went home. When they got near, unexpectedly, they saw smoke ascending straight up. "Well," he said, "she must still be alive." When they got there, they found that she was indeed alive, but just barely hanging on. The second wife poured soup into her mouth and she gradually revived. They took her home with them. "The man was a wolf, as was his wife" — the wife in question would seem to be his second one, since we are told that she was a spirit. She apparently lived in Spiritland in human form as a Giant, but retained her essential canine nature. The man's brother, who is a Wolf Spirit, does seem to stay behind there, suggesting that these Giants may also have been Wolf Spirits. However, the first wife may also have been a Wolf Spirit come to earth to live as a human as well, since she manages to survive in the prolonged absence of her husband. Key:  Two brothers part company (vs. find one another). They are beings of two unequal types, one of whom is human, the other of whom is not. They make (or violate) a compact of mutual aid between them. They agree to divide (or bring back together) a dead body. The human marries. The human is praised (or criticized) for (not) rendering the help conventionally expected of him. A person acts or speaks contrary to his actual belief, which reflects a lack of faith. The human is victorious (or defeated) in his enterprise. As a result, people are (not) able to eat. I. Two Wolf Spirit brothers part company,  the older brother living as a wolf, the younger brother living as a human. They make a compact:  the older brother gets the liver of each kill, the younger brother gets the rest of the deer. The human marries. He is a very successful hunter, and  as a result the couple eats very well. The wife says that she wants the liver for tanning. His wife criticises him for wasting the liver and not doing as she asked. II. The human violates the compact  by keeping the liver. His wife has been deceptive: she eats the liver, rather than using it for tanning. The man's hunting power fails completely,  and they begin to starve. III. The man leaves his wife, and finds his animal brother. The older brother is a wolf, the younger brother is human. They cooperate to kill a deer. He gives the older brother the liver. The elder criticizes the man for his disobedience. IV. The brothers drift off together on iceberg. They make a compact:  the younger kills the elder, and makes two bracelets out of his skin. The human marries a Giantess. A grandmother criticizes her orphan grandson for over-reaching his station by contemplating making friends with a superior. Nevertheless, the grandmother asks the man if the orphan can join him, even though she does not believe in her grandson. V.  The human says that it is a good idea for the orphan to befriend him,  as he needs a partner. The human teams up with the orphan,  who is a Giant,  and they make a compact as friends. The Bad Giants challenge the human in order to eat him. The chief does not believe in the human's powers, but consents anyway. The friends are victorious over the Giants. The Giants lament that they are not drinking soup. VI. The man removes his bracelets in the sweat bath. This violates the compact made with his brother. The man forgets about his bracelets made of his brother's skin. Therefore, the human is no longer augmented with wolf power. The villagers praise the human for his help. The chief is now confident in the human's prowess. Nevertheless, the friends are defeated,  killed by the Giants, and eaten. VII. The Wolf Spirit revives himself and gathers the bones of his brother save for the missing knee cap. The Wolf Spirit transforms himself into a dog. A maiden keeps the knee cap in her mouth. The woman wants to keep the bone from the dog to avenge her brother who was killed by the human. The women are sympathetic to the dog,  and criticize the maiden for not giving the dog the knee bone. However, the dog gets the bone  by biting it out of her cheek. VIII. The wolf gathers all the bones together. The wolf dies bringing the human and orphan back to life; then the human brings the wolf back to life. The older brother criticizes the human for not being obedient. The wolf and human return to the chief together; the Giant orphan goes home. When the Giants see the orphan alive, they feel that they can never win. The human is reunited with his wife. The human has no confidence that his first wife is still alive, but his mother-in-law urges him to return anyway. The human believes that his first wife could not feed herself. IX. The two brothers part company,  agreeing that they they should not live together,  except that when the human dies, he may rejoin his brother. The wolf has had bad luck teaming up with the human. The Wolf Spirit was not created to live among humans. The human finds that his first wife is still alive,  contrary to his expectations. The human has therefore succeeded in his efforts. The second wife gives soup to the first. Comparative Material. The situation of the man and his first wife recalls in many ways the Hebrew myth of Adam and Eve. This is what both stories have in common. A great spirit forbids the man to arrogate to himself a certain food item, and if he but obeys, then his life will be prosperous beyond the ordinary; but one day his wife tempts him in a deceptive way to bring her back the forbidden food. It is eaten with the immediate result that the state of grace is lost, which not only brings misery upon both man and wife, but frustrates the aims of the great spirit as well. The man, at least, leaves his idyllic land. The Hočąk story moves to an episode that looks something like a partially inverted Cain and Abel myth. The older brother is capable and obedient in his observation of the right way to act, whereas the younger brother is not. The younger brother comes to kill the elder, and the great spirit gives the brother a mark that will help preserve his life against hostile forces. There is an interesting (re)creation episode as well. The Wolf Spirit collects up the bones of the man that he wants to create, but finds that it will take just one more bone to make the creation complete. Instead of a bone taken from the man to create a woman, the bone is taken from the side of a woman to create a man. Instead of her being a helpmate, she is kin to the Giant who killed the man. Furthermore, she is trying to frustrate his revival. The bone taken out of her side is already his. This is also like the forbidden liver, as she forbids the spirit from having it. The role of the serpent is played by her chorus who do not advise evil, but rather good. The true forbidden fruit here is the fruit of cannibalism, the obsession of the Bad Giants. The chorus of women do not tempt, but perform its opposite, ridicule. Links: Earthmaker, Giants, Wolf & Dog Spirits, Beavers, Gourd Rattles. Stories: relating to dogs or wolves: The Gray Wolf Origin Myth, A Man and His Three Dogs, Wolves and Humans, The Wolf Clan Origin Myth, The Old Man and His Four Dogs, Worúxega, The Dogs of the Chief's Son, The Dog that became a Panther, Baldheaded Warclub Origin Myth, The Wild Rose, The Man Whose Wife was Captured, The Resurrection of the Chief's Daughter, The Canine Warrior, The Dog Who Saved His Master, The Raccoon Coat, Wojijé, The Big Eater, Why Dogs Sniff One Another, The Healing Blessing, The Medicine Rite Foundation Myth, Trickster Loses His Meal, Sun and the Big Eater, Redhorn's Sons, Trickster, the Wolf, the Turtle, and the Meadow Lark, Hog's Adventures, Holy One and His Brother, The Messengers of Hare, Pete Dupeé and the Ghosts, Grandmother's Gifts, The Hočąk Migration Myth, Bladder and His Brothers, The Stench-Earth Medicine Origin Myth, The Old Man and the Giants, Rich Man, Boy, and Horse, Kunu's Warpath, Morning Star and His Friend, Chief Wave and the Big Drunk; Peace of Mind Regained (? ); mentioning white wolves or dogs: The Gray Wolf Origin Myth, The Old Man and His Four Dogs, The Man Whose Wife was Captured, Worúxega, The Messengers of Hare, Wolf Clan Origin Myth (vv. 1, 2), Wolves and Humans, A Man and His Three Dogs, Grandmother's Gifts, Peace of Mind Regained (? ); featuring Giants as characters: A Giant Visits His Daughter, Turtle and the Giant, The Stone Heart, Young Man Gambles Often, Spear Shaft and Lacrosse, Redhorn Contests the Giants, The Sons of Redhorn Find Their Father, Morning Star and His Friend, The Reincarnated Grizzly Bear, The Old Man and the Giants, Shakes the Earth, Redhorn's Father, The Hočągara Contest the Giants, The Roaster, Grandfather's Two Families, Redhorn's Sons, The Meteor Spirit and the Origin of Wampum, Thunder Cloud is Blessed, Little Human Head, Heną́ga and Star Girl, Rich Man, Boy, and Horse, Sun and the Big Eater, The Big Eater, How the Thunders Met the Nights, The Origins of the Milky Way, Ocean Duck, The Blessing of a Bear Clansman, Wears White Feather on His Head, cf. The Shaggy Man; featuring Good Giants as characters: Young Man Gambles Often, Shakes the Earth; mentioning beavers: Hare Retrieves a Stolen Scalp, Old Man and Wears White Feather, The Dipper, The Animal Spirit Aids of the Medicine Rite, The Chief of the Heroka, The Arrows of the Medicine Rite Men, Turtle and the Merchant; about journeys to and from Spiritland: The Four Slumbers Origin Myth, Ghost Dance Origin Myth II, The Resurrection of the Chief's Daughter, The Journey to Spiritland, Sunset Point, The Medicine Rite Foundation Myth, The Lame Friend, Two Roads to Spiritland, Pete Dupeé and the Ghosts, Holy One and His Brother, Ghost Dance Origin Myth I, The Foolish Hunter, Waruǧábᵉra, The Thunderbird, The Boy who was Captured by the Bad Thunderbirds, The Twins Get into Hot Water, The Two Brothers, The Lost Blanket, Earthmaker Sends Rušewe to the Twins, The Man who went to the Upper and Lower Worlds, The Petition to Earthmaker, Wears White Feather on His Head, Buffalo Dance Origin Myth, Thunder Cloud Marries Again, The Shawnee Prophet — What He Told the Hočągara, Aračgéga's Blessings, The Blessing of a Bear Clansman, The Man Whose Wife was Captured; mentioning livers: The Green Man (raccoon), Waruǧábᵉra; mentioning the patella (kneecap) bone: Shakes the Earth; mentioning teeth: The Animal who would Eat Men, Hare Recruits Game Animals for Humans, Hare and the Dangerous Frog, The Girl who Refused a Blessing from the Wood Spirits, The Two Boys, The Birth of the Twins, The Twins Disobey Their Father, Wears White Feather on His Head, The Dipper, Wolves and Humans, The Commandments of Earthmaker, The Children of the Sun, The Green Man, Holy One and His Brother, Partridge's Older Brother, The Brown Squirrel, Hare Secures the Creation Lodge of the Medicine Rite, The Medicine Rite Foundation Myth, East Shakes the Messenger, Lifting Up the Bear Heads, Buffalo Clan Origin Myth; mentioning sweat lodges or sweat baths: The Twins Get into Hot Water, The Lost Blanket, The Green Man, Bladder and His Brothers (v. 1), Hare Establishes Bear Hunting, Hare Recruits Game Animals for Humans, The Thunderbird, Snowshoe Strings, Waruǧábᵉra, The Red Man, The Chief of the Heroka, The Birth of the Twins (v. 2), Lifting Up the Bear Heads, The King Bird, Little Human Head, Eats the Stinking Part of the Deer Ankle, The Shaggy Man, Soft Shelled Turtle Gets Married, The Dipper, The Two Boys, The Medicine Rite Foundation Myth (v. 2); mentioning snow: Waruǧábᵉra, The Glory of the Morning, Holy One and His Brother, Wolves and Humans, Grandfather's Two Families, The Four Steps of the Cougar, Brave Man, Redhorn's Father, Bladder and His Brothers, The Stench-Earth Medicine Origin Myth, The Old Man and the Giants, Old Man and Wears White Feather, Great Walker's Warpath, North Shakes His Gourd, The Fleetfooted Man, Lake Wąkšikhomįgra (Mendota): the Origin of Its Name, Witches, Shakes the Earth, Thunderbird Clan Origin Myth, Trickster Gets Pregnant, The Raccoon Coat, Silver Mound Cave, Soft Shelled Turtle Gets Married; mentioning the Ocean Sea (Te Ją): Trickster's Adventures in the Ocean, Hare Retrieves a Stolen Scalp (v. 1), Otter Comes to the Medicine Rite, The Rounded Wood Origin Myth, The Baldheaded Warclub Origin Myth, Trickster and the Children, The Twins Retrieve Red Star's Head, Wears White Feather on His Head, How the Thunders Met the Nights (Mąznį’ąbᵋra), Bear Clan Origin Myth (vv. 2a, 3), Wolf Clan Origin Myth (v. 2), Redhorn's Sons, Grandfather's Two Families, Sun and the Big Eater, The Journey to Spiritland (v. 4), The Sons of Redhorn Find Their Father (sea), The Dipper (sea), The Thunderbird (a very wide river), Wojijé, The Twins Get into Hot Water (v. 1), Redhorn's Father, Trickster Concludes His Mission, Berdache Origin Myth, Thunder Cloud is Blessed, Morning Star and His Friend, How the Hills and Valleys were Formed. Themes: a person is not satisfied with the abundance she has, but wants more (for the sake of variety): The Foolish Hunter, The Greedy Woman; a woman states a good reason for hunting a particular kind of animal, but when it is produced, she attempts to make use of it for some other, self-indulgent purpose: The Chief of the Heroka; starvation: The Brown Squirrel, The Red Man, The Old Man and His Four Dogs, A Man and His Three Dogs, Sun and the Big Eater, Bird Clan Origin Myth, Kaǧiga and Lone Man, The Shaggy Man, The Bungling Host, The Twins Retrieve Red Star's Head, Jarrot and His Friends Saved from Starvation; a canine makes hunting good for a human in exchange for a small left over portion of the kill: A Man and His Three Dogs (deer lungs), The Dogs of the Chief's Son (leftovers); some part of what a man kills must be left for an Animal Spirit according to an agreement made between them: The Boy who was Blessed by a Mountain Lion (the headless bodies of humans), The Man Whose Wife was Captured (a whole deer); the fruit of the hunt is stolen: Porcupine and His Brothers, Crane and His Brothers, The Spotted Grizzly Man, Old Man and Wears White Feather, The Brown Squirrel; eating something has predictably dire consequences: Trickster Eats the Laxative Bulb; violating the prohibitions laid down by an elder brother leads to disaster: Bladder and His Brothers (v. 3), The Green Man, The Twins Retrieve Red Star's Head, The Children of the Sun; hunting is bad because of the misconduct of a man's wife (or mother-in-law) towards that which aids the hunt: Sun and the Big Eater, The Red Man, The Dogs of the Chief's Son, A Man and His Three Dogs; someone depressed by prospects at home goes (at a run) into the wilderness to die: The Moiety Origin Myth, Bluehorn's Nephews, Bluehorn Rescues His Sister; something is of a (symbolic) pure white color: White Bear, Deer Spirits, The Journey to Spiritland (v. 4), White Flower, Big Eagle Cave Mystery, The Fleetfooted Man, Thunderbird and White Horse, The Orphan who was Blessed with a Horse, Worúxega, The Two Boys, The Lost Blanket (white spirits), Skunk Origin Myth, He Who Eats the Stinking Part of the Deer Ankle, A Man and His Three Dogs, The Messengers of Hare, The Brown Squirrel, The Man Who Fell from the Sky, Bladder and His Brothers, White Thunder's Warpath, The Shell Anklets Origin Myth, The Dipper, Great Walker's Medicine (v. 2), Creation of the World (v. 12), Hare Secures the Creation Lodge, The Descent of the Drum, Tobacco Origin Myth (v. 5), The Diving Contest, Otter Comes to the Medicine Rite, The Arrows of the Medicine Rite Men, The Animal Spirit Aids of the Medicine Rite, Grandmother's Gifts, Four Steps of the Cougar, The Completion Song Origin, North Shakes His Gourd, Lifting Up the Bear Heads, Thunder Cloud is Blessed, Peace of Mind Regained; a deer is killed with a club: Fireman's Brother; even though it is cold enough to freeze a man, two people (one of whom is a spirit) have the supernatural power to stay warm: How the Thunders Met the Nights; a human being physically travels to Spiritland without having died: The Resurrection of the Chief's Daughter, Ghost Dance Origin Myth II, Pete Dupeé and the Ghosts, Sunset Point, Snowshoe Strings, The Thunderbird, The Boy who was Captured by the Bad Thunderbirds, The Star Husband, Waruǧábᵉra, How the Thunders Met the Nights, The Shaggy Man, Eats the Stinking Part of the Deer Ankle, Buffalo Dance Origin Myth, Aračgéga's Blessings, The Blessing of a Bear Clansman, The Lost Blanket, The Twins Get into Hot Water, The Daughter-in-Law's Jealousy, The Petition to Earthmaker, The Boy who would be Immortal, Thunder Cloud Marries Again, Rainbow and the Stone Arch (v. 2), Trickster Concludes His Mission; anthropophagy and cannibalism: A Giant Visits His Daughter, Turtle and the Giant, The Witch Men's Desert, The Were-Grizzly, Grandfather's Two Families, The Roaster, Redhorn's Father, Hawk Clan Origin Myth, The Lost Blanket, Young Man Gambles Often, The Shaggy Man, The Twins Get into Hot Water, Partridge's Older Brother, The First Fox and Sauk War, The Fox-Hočąk War, The Hočągara Contest the Giants, Morning Star and His Friend, Baldheaded Warclub Origin Myth, The Seven Maidens, Šųgepaga, The Reincarnated Grizzly Bear, The Woman who Loved Her Half-Brother, The Blessing of a Bear Clansman, Shakes the Earth, The Stone Heart, Thunder Cloud is Blessed; a challenger comes shaking a gourd rattle: Spear Shaft and Lacrosse, The Roaster, Grandfather's Two Families, How the Thunders Met the Nights, The Race for the Chief's Daughter, Redhorn Contests the Giants; as part of a blessing, a spirit orders the beneficiary to kill him and make magical use of his body: A Waterspirit Blesses Mąnį́xete’ų́ga, The Seer, Eats the Stinking Part of the Deer Ankle, Paint Medicine Origin Myth, The Elk's Skull; someone kills his own kinsman: The Chief of the Heroka (wife), The Red Man (wife), Worúxega (wife), The Man Whose Wife was Captured (v. 2) (wife), Bluehorn's Nephews (mother), The Green Man (mother), Waruǧábᵉra (mother), Partridge's Older Brother (sister), The Woman who Loved Her Half-Brother (sister), The Were-Grizzly (sister), Crane and His Brothers (brothers), The Diving Contest (brother), The Twins Get into Hot Water (grandfather), The Chief Who Shot His Own Daughter (daughter), The Birth of the Twins (daughter-in-law), The Woman's Scalp Medicine Bundle (daughter-in-law), Snowshoe Strings (father-in-law); a spirit's brother is killed and his hide is used as an artifact by his killer: Holy One and His Brother (door flap), Bladder and His Brothers (bladders); powerful beings give a human a charm which they say will bring him benefits: Eats the Stinking Part of the Deer Ankle, The Lost Child, The Thunder Charm, Witches; a spirit has a (fasting) dream of a human: The Daughter-in-Law's Jealousy, The Thunderbird; a human marries a spirit: The Daughter-in-Law's Jealousy (a Thunderbird, a Nightspirit, and two Waterspirits), The Thunderbird (a Thunderbird), How the Thunders Met the Nights (a Nightspirit), The Shaggy Man (a Bear Spirit), The Woman who Married a Snake (a Snake Spirit), The Star Husband (stars), Little Human Head (a Louse Spirit), Eats the Stinking Part of the Deer Ankle (Buffalo Spirit), The Phantom Woman (Waterspirit); marriage to a yųgiwi (princess): The Nannyberry Picker, Baldheaded Warclub Origin Myth, The Race for the Chief's Daughter, The Daughter-in-Law's Jealousy, The Big Stone, Partridge's Older Brother, Redhorn's Sons, The Seduction of Redhorn's Son, The Resurrection of the Chief's Daughter, River Child and the Waterspirit of Devil's Lake, The Roaster, Soft Shelled Turtle Gets Married, Eats the Stinking Part of the Deer Ankle, The Two Boys, Spear Shaft and Lacrosse, The Shaggy Man, The Thunderbird, The Red Feather, The Orphan who was Blessed with a Horse, The Birth of the Twins (v. 3), Trickster Visits His Family, The Woman who Loved Her Half-Brother, Redhorn's Father, Old Man and Wears White Feather, Morning Star and His Friend, Thunderbird and White Horse, Rich Man, Boy, and Horse, Shakes the Earth, The Nightspirits Bless Čiwoit’éhiga; marriage to a Giant: The Stone Heart, A Giant Visits His Daughter, Young Man Gambles Often, The Reincarnated Grizzly Bear, Redhorn Contests the Giants, The Roaster, Redhorn's Sons, Redhorn's Father; a boy has a burnt chest: The Roaster; an old woman scolds her orphan grandson for being presumptuous even though he later turns out to be the most capable person in the village: The Roaster, The Meteor Spirit and the Origin of Wampum, Brass and Red Bear Boy, The Red Feather; contests with the Giants: Spear Shaft and Lacrosse, Redhorn's Father, The Roaster, Young Man Gambles Often, Little Human Head, Redhorn Contests the Giants, Redhorn's Sons, Morning Star and His Friend, The Reincarnated Grizzly Bear, Sun and the Big Eater, The Big Eater, The Hočągara Contest the Giants, The Old Man and the Giants, The Meteor Spirit and the Origin of Wampum, Shakes the Earth, The Origins of the Milky Way, The Shaggy Man, Grandfather's Two Families; a human turns into a (spirit) animal: How the Thunders Met the Nights (Thunderbird), Waruǧábᵉra (Thunderbird), The Dipper (hummingbird), Keramaniš’aka's Blessing (blackhawk, owl), Elk Clan Origin Myth (elk), Young Man Gambles Often (elk), Sun and the Big Eater (horse), The Reincarnated Grizzly Bear, The Were-Grizzly, Partridge's Older Brother (bear), The Woman who Loved her Half-Brother (bear), Porcupine and His Brothers (bear), The Shaggy Man (bear), The Roaster (bear), Wazųka (bear), The Spotted Grizzly Man (bear), Brass and Red Bear Boy (bear, buffalo), Worúxega (wolf, bird, snake), Eats the Stinking Part of the Deer Ankle (buffalo), The Brown Squirrel (squirrel), The Skunk Origin Myth (skunk), The Fleetfooted Man (otter, bird), A Waterspirit Blesses Mąnį́xete’ų́ga (otter), The Diving Contest (Waterspirit), The Woman who Married a Snake (snake, Waterspirit), The Omahas who turned into Snakes (four-legged snakes), The Twins Get into Hot Water (v. 3) (alligators), Snowshoe Strings (a frog), How the Hills and Valleys were Formed (v. 3) (earthworms), The Woman Who Became an Ant, Hare Kills a Man with a Cane (ant); violating the terms of a blessing does harm: The Medicine Rite Foundation Myth, The Necessity for Death, Hare Retrieves a Stolen Scalp, The Dog that became a Panther, The Boy who was Blessed by a Mountain Lion, Disease Giver Blesses Jobenągiwįxka, The Greedy Woman, Trickster, the Wolf, the Turtle, and the Meadow Lark (meadow lark), Eats the Stinking Part of the Deer Ankle; a hero and his friends are killed because the Giants are victorious in a wrestling match: Redhorn Contests the Giants; an empty hide comes to life: Mijistéga and the Sauks, Migistéga’s Magic, The Woman who Loved Her Half-Brother; an animal spirit transforms himself from one kind of animal into another: The Orphan who was Blessed with a Horse (Thunderbird > horse), Bear Clan Origin Myth (bear > blackbird > bear), A Man and His Three Dogs (wolf > dog), The Dog that became a Panther, The Were-fish (raccoon > fish), Lake Wąkšikhomįgra (Mendota): the Origin of Its Name (raccoon > fish), The Spirit of Maple Bluff (raccoon > fish); someone returns from the dead: Ghost Dance Origin Myth II, The Resurrection of the Chief's Daughter, Sunset Point, Pete Dupeé and the Ghosts, White Fisher, The Blessings of the Buffalo Spirits, The Boy who was Blessed by a Mountain Lion, The Shaggy Man, The Two Brothers, The Two Boys, Eats the Stinking Part of the Deer Ankle, The Red Man, The Chief of the Heroka, The Man Whose Wife was Captured, Waruǧábᵉra, The Lost Blanket, The Old Man and the Giants; someone is brought back from the dead when a man gathers together all his bones and voices calls of alarm over them: Redhorn's Sons, The Raccoon Coat; two brothers revive each other in succession: The Twins Cycle; the howling of a spirit wolf four times brings someone back to life: The Man Whose Wife was Captured, cf. The Resurrection of the Chief's Daughter; a mortal is returned to earth from the spirit village that he is visiting: Waruǧábᵉra, The Thunderbird, Two Roads to Spiritland, The Shaggy Man, Buffalo Dance Origin Myth, Eats the Stinking Part of the Deer Ankle, Pete Dupeé and the Ghosts, Snowshoe Strings, The Daughter-in-Law's Jealousy, The Foolish Hunter, The Boy who was Captured by the Bad Thunderbirds, The Petition to Earthmaker. 1 Paul Radin, "White Wolf," Winnebago Notebooks (Philadelphia: American Philosophical Society) #10: 1-64. 2 Åke Hultkrantz, The Religions of the American Indians (Berkeley: University of California Press, 1979) 141-142. See Weston La Barre, Muelos: A Stone Age Superstition about Sexuality (New York: Columbia University Press, 1984) 49 and especially footnote 10: 67-68.